Convenient built-in touch lighting will help you to stay focused and work through those long nights. With the simple touch a button you can illuminate your workspace without the hassle of plugging in a separate lamp. Save desk space by having lights built into shelves on your desks or office hutches. Also display awards and more in bright light to grab the attention of clients, colleagues and more. Comfortably work for hours without sacrificing the look of a beautiful drawer front. Flip-down keyboard drawers have the look of a standard drawer while having the functionality to store your keyboard out of site for a clean workspace. Turn your home office into a space of refined style and optimal productivity with this executive credenza. Features like a wire management back panel and adjustable task lighting help to clear up your work space, and ensure that you'll have no trouble being as productive as possible. The antique toffee finish and traditional detailing on this piece give it a sense of importance. The Amelia Home Office Traditional Executive Credenza with Adjustable Task Lighting by Liberty Furniture at VanDrie Home Furnishings in the Cadillac, Traverse City, Big Rapids, Houghton Lake and Northern Michigan area. Product availability may vary. Contact us for the most current availability on this product. 487-HO131 Jr. Executive Credenza Hutch 1 66.88" 16" 48"
487-HO120B Jr. Executive Credenza Base 1 19.5" 23.5" 24"
487-HO120T Jr. Executive Credenza Top 1 66" 24" 30.5"
Enjoy traditional style and a sophisticated look with the Amelia bedroom collection. 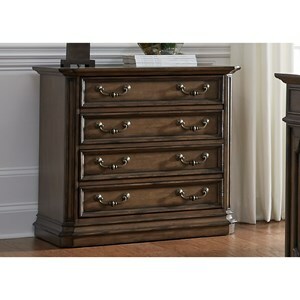 Each piece features a heavy crown molding and a handsome antique toffee finish. The storage pieces boast finished drawer interiors and felt-lined top drawers to keep your delicate belongings looking new for longer. This entire collection works together to complement nearly any color or style of existing bedroom furniture. Bring this collection home and see the luxury for yourself. The Amelia Home Office collection is a great option if you are looking for furniture in the Cadillac, Traverse City, Big Rapids, Houghton Lake and Northern Michigan area. Browse other items in the Amelia Home Office collection from VanDrie Home Furnishings in the Cadillac, Traverse City, Big Rapids, Houghton Lake and Northern Michigan area.